An absolutely stunning necklace fashioned from ethnographic elements into a new designer necklace. 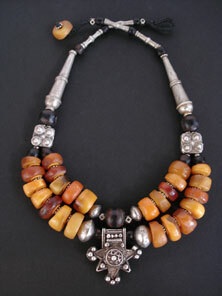 A two strand genuine antique Moroccan natural amber and black coral necklace. This amber is not bakelite, 'african amber', phenolic resin or any imitation, but is real natural fossil amber which has become scarce and incredibly difficult to obtain. The colours are divine conjuring the essence of Morocco with such colours as saffron, nutmeg and cardamon. Between each amber bead I have used African vulcanite heishi beads and silver daisy spacers to protect and cushion the treasured amber beads.Lots of old silver has been used in this necklace with the centre pendant being an old Berber traditional silver cross, 2 antique 2-hole silver spacer beads from Central Asia, Ethiopian coin silver rondelle & end cone beads and old cornerless Tuareg silver beads. Handwoven button closure with amber bead. For many civilizations, to wear amber was to prosper and was thought to possess restorative properies and the power to ward off evil.